A good list in some ways; a bad list in others. They seem to have confused "important" and "influential." As these lists often do. They aren't the same thing. They also seem to have confused the person and the accomplishment. The telegraph may have influenced the course of the country, but Samuel Morse didn't. Not enough to put him on the list. They gave artists and "pop" celebrities short shrift. And despite Elvis, went mostly for establishment figures. Herman Melville? P.T. Barnum? Stephen Foster? William Faulkner? Louis Armstrong? How about Bob Dylan, John Wayne, Michael Jackson, Marilyn Monroe, or Michael Jordan? I'd put one or two of these choices against all five of Atlantic's choices in terms of influence. As for Natives, who would be the no. 1 choice? Perhaps Geronimo. From both sides--Native and non-Native--he must be the icon of Indianness. 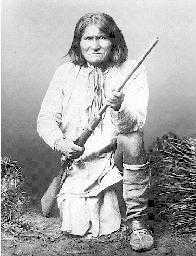 Natives see him as a savage resistance fighter determined to be free. Non-Natives see him as simply the ultimate savage. Who else? Siting Bull? Pocahontas? I'm not sure how much they accomplished, but they were hugely influential as symbols. One or both of them could go on the list also. Tecumseh may qualify as the most accomplished Native in American history. But his accomplishment--building a widespread tribal coalition--fell apart at the end. So I'm not sure how much influence it had on the course of US history. Anyone else? Sacagawea? She had one big accomplishment: keeping Lewis and Clark alive during the winter of 1805-6. But that was a single small role in a major expedition, and it's not clear how influential the expedition was. I wouldn't include her. Jim Thorpe? He was hugely accomplished, but I'm not sure how his accomplishments influenced anyone else. Or changed the course of history. The historians may have been right to limit sports figures to people like Jackie Robinson and Babe Ruth. The code talkers? Maybe if one of them had singlehandedly created and operated the group. But you can't have a group of 400 or whatever in a list like this. Otherwise you'd have to nominate George Washington's or FDR's Cabinet. Or the soldiers who landed at Normandy. Despite the "influential" tag, much of this list is about symbolism. For instance, Jackie Robinson didn't integrate baseball or other sports by himself. He's important as the first person to break the color--as a symbol of change. But if he hadn't been first, someone else would've been. Like Neil Armstrong walking on the moon, Robinson didn't cause the change himself. He represented the forces of change working their way through society. He "influenced" history by being in the right place at the right time. For the first century, most of America's "foreign" policy concerned the Indian question. Turner's Frontier Thesis argued that we defined ourselves in relation to the wild West--i.e., Indians. Taming the wilderness, turning "savagery" into civilization, is America's founding myth. Symbolically, Indians loomed huge in our imagination. They played a much greater role than their actual numbers or accomplishments suggested. Therefore, you could easily argue for including one or more of them on the list. They were prominent for half our history, so they deserve some spots. For more on the subject, see 100 Most Significant Americans? and Indians in the Celebrity 100.